I don't mean to rub things in, but it was another weekend of pure weather perfection here in the Austin area. Things were busy, super busy, over the past few days. I cannot and will not complain. Between brunch with a local blog bud, our last volleyball match for the spring season, birthday party in the sun, sports fundraiser and a Sunday full of fun, the weekend flew by faster than a blink. The top and shorts are my first pieces from River Island and I could not be more thrilled with the quality and fit. For me, it is so hard find a pair of shorts that are not only stylish, but a length that are age appropriate; ones I can feel confident wearing. The Boho inspire printed ones I am wearing today did not disappoint. I have been ordering styles from UK brands for over a year now. While it may take it little longer to receive items via mail, the wait is well worth it. If you are unsure of the sizing conversion from UK to US, I found a sizing guide that will hopefully make things easier if you decide to order from across the pond. I am off to push rewind on the weekend and watch the afternoon in the park with my husband, kids and our spotted four-legged friend. Once again, Monday, you came back around too soon. Hottie!! Loving this look girl, those shorts are so cute!! Love how you styled this outfit! Love everything about this look! We spend out whole weekend at the pool - I don't want the weekend to end. You look so Summery, love the printed shorts. If you get the chance, please share your amazing post on my link-up today. Look at you rocking those shorts! I have some printed floral fabric ones that I love but I cannot make myself wear out of the house! Lol! Maybe one day soon. Love all of the vibrant color in this outfit! Those shorts are amazing! LOVE this outfit - I think it's probably one of my favorite summer outfits you have. And I think I have a sun hat exactly like that one! This is gorgeous! I love the color combinations and the hat! Great look. Those shorts are so cute!! I feel like I need to re-evaluate some of my wardrobe now that I'm turning another year older this summer. UGH. Love the fun colors and summery look! It's finally feeling nice here so that means we have like 3 days until it becomes unbearably hot and humid for the summer. ha! What an adorable outfit–I'm loving that bright blue clutch! This is such a fun summery look! You look beautiful in yellow! You are just such a beautiful lady, Shanna! I am loving those heels... really! They're so perfect! Also, even if something takes longer to receive in the mail, I find the wait makes me that much more excited haha!! I'm loving all the colors here- they go together so well. Love this look! Those shorts are everything - the print adds such a pop to your outfit. Hot mama!! Love love love those shorts and yay for great weekends! LOVE River Island! I shopped there a ton when I was touring England! Wow this is such a Gorgeous outfit!!! Love the bright colors and your clutch. Your rockin it today girly. Gorgeous! Love the yellow and blue together! Pretty colors! 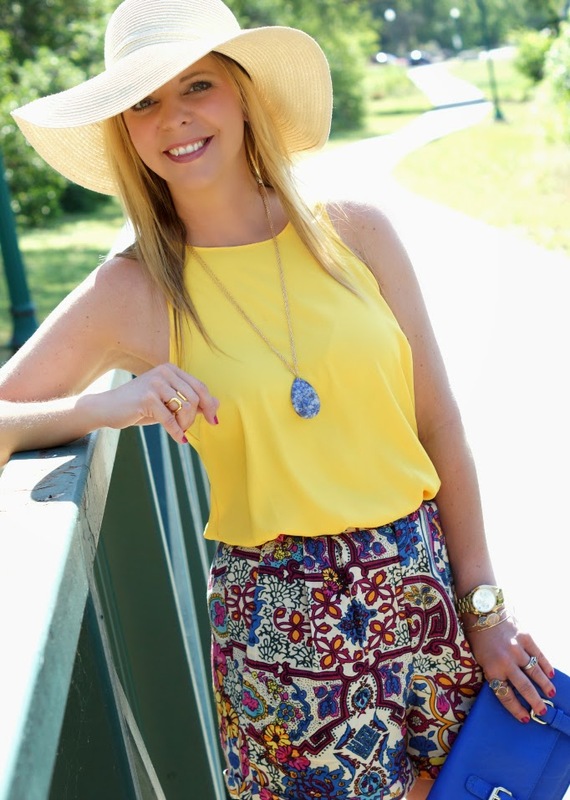 Love the yellow, blue and printed shorts paired together! I love the print of those shorts!! You look absolutely gorgeous in this outfit! I am in love with the printed shorts!! you look amazing. I love those printed shorts but I'm not sure if I could pull them off! This is such a cute look, Shanna! You look fabulous! I am loving those patterned shorts... I have been wanting to add some to my closet so I will have to check them out! I just love this whole look! The colors are perfect for summer. I'm really into patterned shorts lately and the print on these is gorgeous. And that hat adds the final touch! Yellow is definitely your color! You look so sassy in that first picture! I love it! Very cute! Oh these shorts have my name written all over them! Love longer but not unfashionable long shorts and the print is amazing! Let's both just press rewind to the weekend. Super fun shorts! And I love the summer hat! ok i feel like i've been saying this often but this is one of my favorite looks ever on you! i love these shorts and I think I need a pair! the length is perfect. Also hi Gus! You look gorgeous! I totally agree, these are the perfect length and the pattern is so pretty. You look fantastic! I love this look on you, and I think the necklace makes the whole thing! You look AMAZING! These shorts are so adorable and so is the hat! Loving those shorts. Here's hoping we get some of your warmth and sunshine here. Sounds like you had a super busy weekend! Love this adorable look! And that hat looks fabulous on you! You look amazing Shanna! Your skin is glowing! Love the casual outfit! Those shorts are amazing and you are such a hottie! Look at you! Oh my gosh I am so in need of that sizing guide! Thank you, thank you! I'm so glad you're having such wonderful weekends! This outfit is perfection, too! The cut of the top and the pattern on the shorts are simply perfect! Love this look!